Students at three Dalton schools will see a new face in the principals' office next school year. The Dalton Board of Education approved Christine Long as the principal of Blue Ridge, Kim Rhyne as the principal of City Park and Lauri Johnson as the principal of Dalton Middle School. Each one of the new principals will start their new positions on July 1. Dr. Tim Scott, superintendent of Dalton Public Schools, said that the district had a number of qualified candidates who applied for the jobs and he was excited to welcome these three ladies to their new positions. "I'm looking forward to having Christine, Kim and Lauri as a part of our administrative team next year," Scott said. "All three of these candidates consistently expressed their love for students, their passion for student achievement and their willingness to support teachers and staff in creating a culture of high expectations in their schools. I am confident that they will all be effective leaders in their schools." "I'm looking forward to having Christine, Kim and Lauri as a part of our administrative team next year," Scott said. "All three of these candidates consistently expressed their love for students, their passion for student achievement and their willingness to support teachers and staff in creating a culture of high expectations in their schools. I am confident that they will all be effective leaders in their schools." 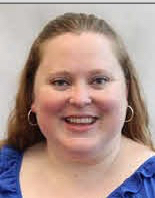 Long comes to Dalton from Ebensburg, Pennsylvania, where she currently serves as a kindergarten-fifth grade principal at Jackson Elementary School and the district Title I and Federal Programs Coordinator for the district. She has 14 years of experience in education having worked in Pennsylvania and in Georgia. She received her master's degree in educational leadership from Edinboro University in Pennsylvania and her Bachelor of Science in English from State University of New York College at Brockport. She also holds a post-master's K-12 Principal's Certification from Edinboro University in Pennsylvania. She holds a Principal K-12 Certification from Florida and Pennsylvania and Elementary Certification in Pennsylvania, New York and Georgia. 2018. Prior to that, she served as the assistant principal at Blue Ridge. Rhyne has been with Dalton Public Schools for 13 years. She holds a Specialist's degree in Technology in Education and a Master of Education degree in Technology from Lesley University, a Bachelor of Science in Elementary Childhood Education from Dalton State College, and a double associate degree in arts in Interpersonal Communications and Radio/TV Broadcasting from Brigham Young University in Idaho. She holds an Educational Leadership Certificate (Tier II) from Valdosta State University, a Gifted Endorsement from CaseNEX in Virginia, a Reading Endorsement from Georgia State University, an ESOL (English Speakers of Other Languages) Certificate from Dalton State College, and an International Teaching Certificate from Brigham Young University in Hawaii. Johnson is the director of organizational improvement for the Southern Regional Education Board (SREB) in Atlanta, Georgia, where she has worked for the last four and a half years. Prior to that time, Johnson worked in Decatur City Schools in Decatur, Georgia, as the director of secondary education and the principal of Decatur High School. She holds a master's degree in information science from University at Albany, Albany, New York and a Bachelor of Art in English from State University of New York at Stony Brook. She has conducted post-master's coursework in curriculum and instruction at Georgia State University and holds her Educational Leadership Certificate from the University of Georgia. The vacancies are a result of three current Dalton principals opting to leave administration. The current principal at Blue Ridge, Dr. Alan Martineaux, is retiring; City Park principal Jason Brock is leaving administration; and Dalton Middle Principal Dr. Phil Jones is returning to the classroom. Their contracts run through June 30, 2019. The Dalton Board of Education approved Christine Long as the principal of Blue Ridge; Kim Rhyne as the principal of City Park and Lauri Johnson as the principal of Dalton Middle School. The Rainbow Unicorns team is practicing their presentation on their "No Bakey Shakey Blankie" invention before the time comes to present at Georgia Tech's K-12 InVenture Prize Competition in March. Three principals have announced their desires to leave administration in Dalton Public Schools next school year. Two semi-final rounds on January 17 narrowed the social studies bee competitors for the entire district down to 12 district finalists. Students and staff in Dalton Public Schools participated in this season of giving by sharing with those in need. All of our schools donated to a number of community non-profit organizations.